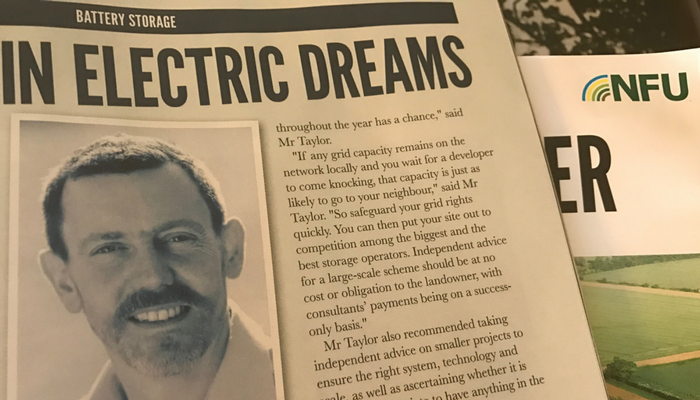 Hugh contributed to an article on battery storage in the National Farmers Union (NFU) British Farmer and Grower magazine in February 2017. In the article entitled ‘Together In Electric Dreams’, Hugh explained that farmer or landowner-owned battery storage schemes are best suited to sites that have year-long, high and variable power use – for example for processing, heating or cooling – ideally twinned with high and intermittent on-site energy generation (from an existing solar or wind scheme, for example). He stressed that landowners should take great care. Energy and battery storage is an unregulated industry. There is no government incentive to add battery storage to existing schemes, so any scheme must be financially viable on its own. Installers often quote paybacks of five to seven years, but only a small proportion of schemes will achieve those returns. On some sites the power generation and consumption profiles could stop some batteries working after a year or two, offering the landowner no financial return at all. Land and property owners must take independent advice to ensure they get the right system, technology, scale and warranties. Should you act at all? A key factor is establishing whether it is appropriate to invest at all. Battery storage opportunities are moderate with a real potential for losing money. You could invest significant capital in a battery project. Taking advice from someone who may say ‘do nothing as you won’t get a good enough return at this point in time’ could save you tens of thousands of pounds for the cost of just a few hours work. For the larger developer-owned projects which you host on your land, Hugh highlighted not going straight in with a developer is important. Seek advice to safeguard your grid rights independently and quickly. You can then put your site out to competition among the biggest and the best storage operators. Independent advice for large-scale schemes should be at no cost or obligation to the landowner, with consultants’ payments being on success only basis. The full article was published in the NFU British Farmer and Grower Magazine February 2017. Available to NFU members only. To get independent, specialist advice to see if battery storage or other technologies are suitable for your site, contact us today on 01993 830571 or send us an email via our Contact Us page.